When Harry Potter and the Sorcerer’s Stone was released on bookshelves in the United States on Sept. 1, 1998, Andrew Carnero ’15 was 5 years old. And while he remembers peering over his older brother’s shoulder to see what he was reading, the UCF theatre major could hardly have predicted the influence the series would eventually have on his life. Today, 20 years later, he serves as one of the stage managers on Broadway for Harry Potter and the Cursed Child. Carnero never dreamed of working on Broadway. Not until he decided to visit New York City for the first time on spring break during his senior year at UCF. Assistant Professor Claudia Lynch helped him make the most of his weeklong trip by setting up opportunities for the Orlando native to shadow professionals in the business. “Having Claudia as a mentor and as a professor in my last year of college and just all of her networking and resources, she’s a big reason for my success and my continued success in New York,” he says. Since moving to New York in 2015, Carnero has worked on productions of The Color Purple, Waitress, Dear Evan Hansen and The Play That Goes Wrong and has been with Cursed Child since day one of its run in the United States on April 22. He discusses life backstage and what makes Cursed Child a special production. What exactly does a stage manager do? We are really the backbone of a production. During the rehearsal process and during the production phase of the show, we are doing a lot of scheduling and running rehearsals. Through those rehearsals, we’re collecting a bunch of information about the actors, about what they’re doing on stage, about all the tech elements — sound, lighting, props and costumes — and we’re channeling all that information to the right departments and basically facilitating the process of bringing the show to life. Once the show is up and running, we’re calling all of the sound and light cues or we are making sure actors are where they need to be and the set is functioning as it is supposed to. We are making sure the director’s vision for the show stays the same every night. It’s a big umbrella of a job. No kidding. What does it take to juggle all those responsibilities and be successful? Be a listener and an observer above all else. Most stage managers start out as production assistants. When you’re a PA, you have to be relentless. Don’t settle for OK. Really push for the best that you can do for the good of the show. It takes a lot of being thorough, being detail-oriented and you have to really listen to what is going on around you. Other than that, a good sense of humor helps. Because at the end of the day, we are just putting on a show, and it’s really easy to get frustrated about all of these things that might be going on. But you have to be able to say, “OK, this is what happened. How are we moving forward?” and be able to laugh at it all with everyone. Did you have to study up on the series to work on Cursed Child? 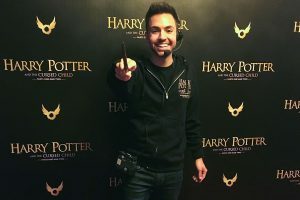 Being a super fan was definitely not a prerequisite, but just by working on the show for the past year, the whole crew has become fans, and I’ve definitely dived into the world of Harry Potter. How do new cast or crew members get initiated to theCursed Child club? We have them sort themselves on the Pottermore website, so that’s fun. We keep tabs of who is in what house. I’m a Ravenclaw, so I’m very proud of that. What was the energy like on opening night, and what has it been like since? Opening night is always so special. Of course, the theater is buzzing. Family and friends are in the audience, so they’re extra excited and super supportive. With Harry Potter specifically, there was so much time and work that had gone into opening this big show, we were all just sort of ready to do the show and show people what we had been putting together. It was such a great night. How has this experience compared to other shows you’ve worked on? Scale wise, it’s the biggest show I’ve done by far. There are so many technical elements to it that blows every show I’ve done out of the water. But every show you work on has something special about it. Be it the cast or the content. Harry Potter is super special because of how of big it is and how technically smart it is. The Color Purple was extremely special because it was my first Broadway show and the music and the cast were so amazing. The Play that Goes Wrong was really special to me because of it originating in London and putting up a Broadway version of that show. Each show is meaningful to me in its own way. How can a UCF student become a Broadway stage manager? A great first step would be to reach out to other stage managers and pick their brains. That’s what sparked my career. Ask good questions and develop a relationship with that person without being too overbearing. That interaction can eventually become: “We’ve had a great chat, I know you want to be a stage manager, and I have a production assistant position open — are you interested?” Try to put yourself out there, ask good questions, seem interested. If this is something that you really want to do and put hard work into, people will pick up on that and help make it happen for you.